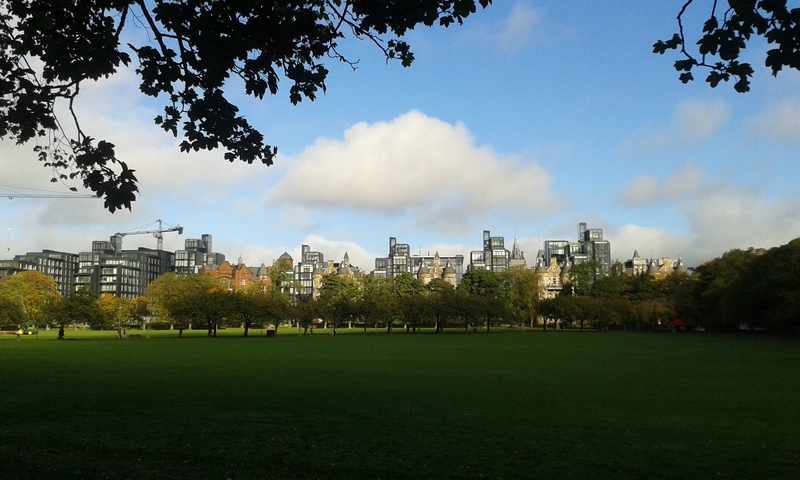 Most visitors love the Scottish capital Edinburgh and so do the inhabitants of Edinburgh! It is easy to see why! The city, with its sandstone buildings, is just south of the mouth of the river Forth. It is built on, and between, breathtakingly beautiful rock formations like the rocks of Edinburgh Castle and Arthur’s Seat. The bustling city life in combination with the closeness to the sea and the magnificent nature of Scotland has, according to Wikipedia, an official population of almost 500 000 persons. All in all the South East Scotland City region holds a population of 1.3 million. to English and Germanic language influences! 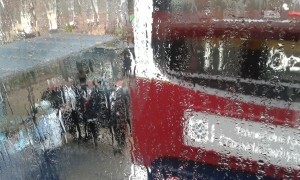 This time, weather-wise, is the worst ever! The rain is drizzling and sometimes pouring and it is hard to keep my city slicker shoes dry! We reach Edinburgh, after an unexpectedly long two-hour bus trip, as traffic was disturbed due to the findings of a Second World War bomb on the development site of the new Queensferry Bridge! 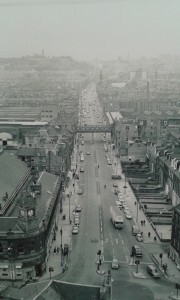 Leith walk during tough times. Picture from Leith Walk Exhibition, October 2015. I shouldn’t have worried, as our fantastic host and guide, Edna, gets us to the city and the harbour community of Leith in time for the interview! The densely populated Leith is located just North of Edinburgh city center. Due to a severe economic decline in the shipping industry, around the Second World War, the area glided into poverty and deprivation and gained a reputation for roughness, drugs and prostitution. However, in recent years the community of Leith has regenerated and the shore of the harbour is now a charming pub and restaurant area that attracts visits from both tourists and inhabitants of Edinburgh. Looking as far back as the 1500’s Leith was the home Mary of Guise, Regent of Scotland, and her daughter Mary, Queen of Scots. 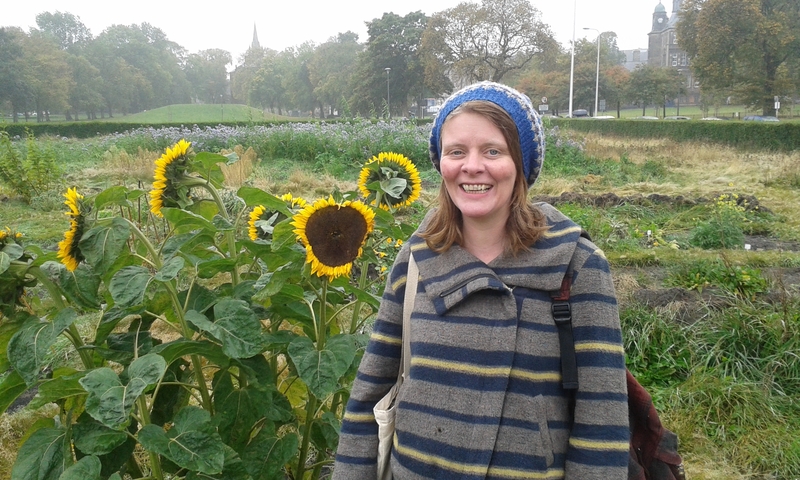 Today we have the pleasure of meeting the Queen of the secret gardens of Leith, Evie Murray! 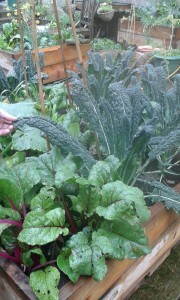 Community Crops in Pots. 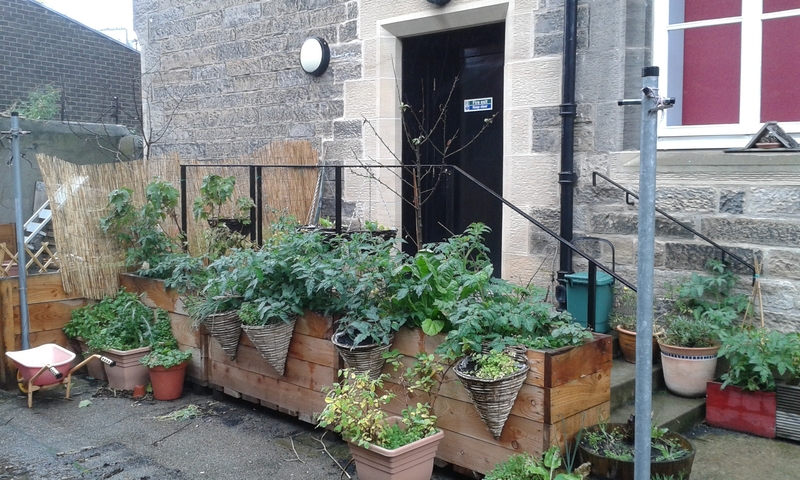 Crops in Pots encourages and supports the inhabitants of Leith to use urban spaces to grow their own vegetables for food and flowers for the well being of the bees! The organisation’s aim is to improve health and well being of individual lives and Community life in Leith. Crops in Pots, the beginning! Life piled up on Evie, being a single mother of four and also a foster mother of two traumatised children. She felt she was raising them in ways she didn’t like. wonder about the meaning of it all. -Right, let’s do something healthy, Evie said and her counter-reaction was to start an urban farming site in her own backyard. Evie’s teenage children offered to care of their younger siblings as she laid the foundation of their garden. 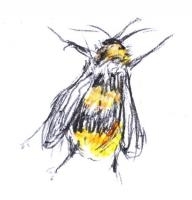 She soon became totally smitten with the quality of the soil, setting the right crops, attracting bees and feeding her family with nutritious, home grown food from her hidden backyard. school in boots and with the children riding in their wheelbarrow, with big smiles on their faces. This attracted attention from teachers and other parents, wondering how they could join in! Stanwell Nursery with the aim to connect the city children to the new beautiful and green habitats. A surprising amount of the children did not know where their food came from. Initially, a common answer to the question would be “from the supermarket” and the children considered the persons helping them to grow vegetables in their schoolyard to be magicians! joined in to do the gardening at the nursery and the word spread. 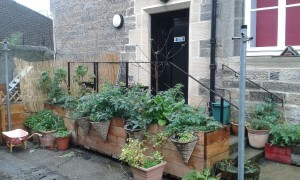 Today, Crops in Pots have several garden sites in backyards around the community of Leith. Passersby on the street would never guess that behind this sandstone wall or house lays a fantastic green garden filled with kale, carrots and flowers that feed the city families and even the bees! the organisation has received funding from Edinburgh City Council and is now employing four persons to keep the gardens and hold educational sessions on climate change and farming for children in the schools and nurseries of Leith. 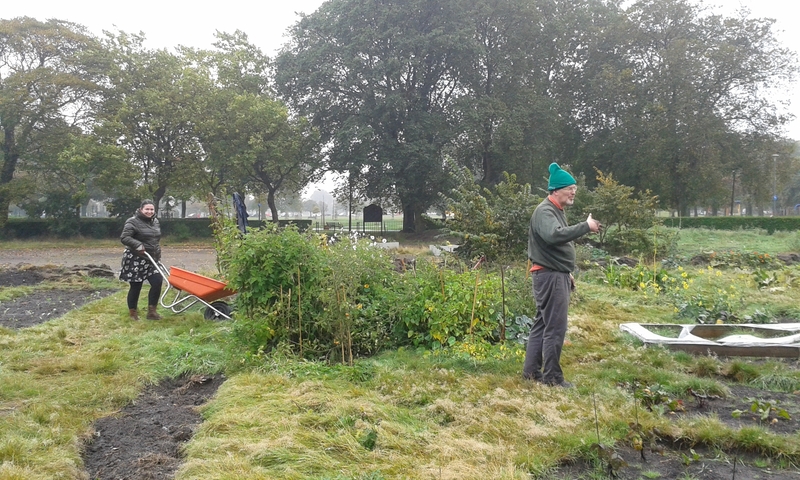 The organisation was also recently appointed access to a two acre / 8000m² plot of land located centrally in the Leith Links Park. The large farming plot goes by the name “the Croft”! 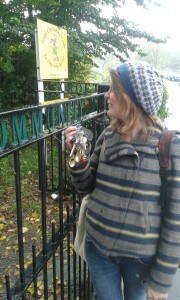 Evie shows me the bundle of keys to all the gardening sites! How big is the community engagement around Crops in Pots? 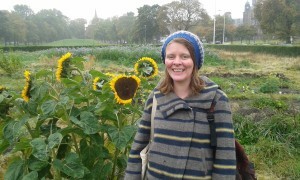 -Suddenly we had hundreds of people engaged in growing food in sporadic locations all over Leith, says Evie. The Leith urban farmers all gathered for the same reasons; being a part of the community, providing healthy food for themselves and their children, growing flowers for bees, wanting their children to connect more to nature, having a healthy outdoor lifestyle and free play as opposed to the more supervised play that children tend to receive in the school and in cities in general. -After a gardening afternoon in the Croft parents have had time to meet and work side by side in the outdoors with their neighbours and kids leave, covered in mud, after a complete adventure and are having a life where they are not being heavily monitored by adults a 100% of the time, says Evie smiling. there has been a large change and they are now reducing the amount of food waste and also composting scraps. 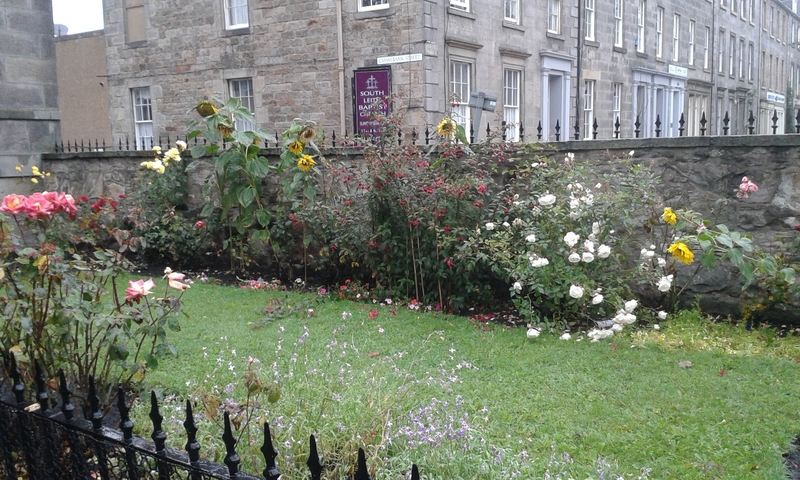 secret gardens of Leith. 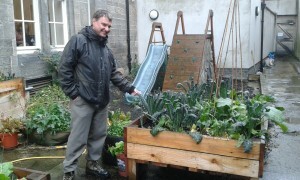 On the way I learn that not only are people reconnecting to nature but also there has been a remarkable difference after having set up the community garden of the Croft. Croft has connected people to become friends that might have a barbeque and are thinking of other fun things to do together! 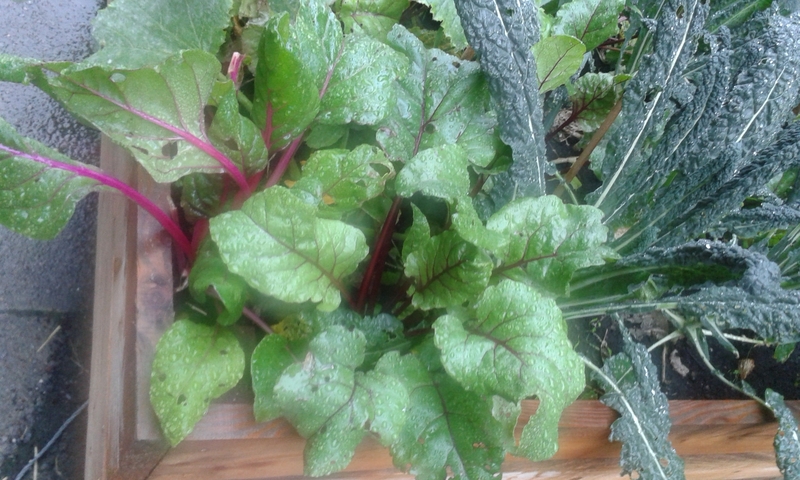 Also, the children of Leith are connecting to nature, learning where their food comes from and living lives with free play outdoors! What will Crops in Pots be in the future? hotel and a plant nursery to mention some ideas. 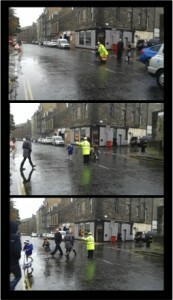 They want to continue working, in a holistic way, for the benefit of Leith Community. -It’s not sustainable if it’s not fun! Next week: Tellus Think Tank meets a Swedish company, with a very strong connection to one of the North American tribes of native Indians, aiming to feed city dwellers of the world with locally grown food, read more here! Get the Tellus Think Tank-newsletter to be notified when our next article is available!